Every 20 minutes i get a pop up by norton telling me it has blocked dl.downloader!gen11 and has it deleted. I can't find any other information besides that it is linked to powershell.exe When i run norton, it doesnt find a thing, when i run antimalwarebytes, it doesnt find a thing. It looks like my system is clean and yet i can't get rid of the pop up. there you go, theres the fixlog. If you are Syncing Firefox it with other Devices reset it. Let me know if all is well or not. no it didnt. I deleted Firefox and deleted the appdata. As soon as i rebooted the popup from Norton was there again. I haven't installed Firefox yet. Which browser were you using at the time? Alson do you have other browsers installed. i have waterfox, edge and internet explorer. I wasn't using a browser at all when it popped up during startup. i can even play a game, have no browsers open and then it pops up as well. Please scan the computer with the Farbar program one more time. Make sure that the box to create a Addition.txt log is checked. Post the log if this entry is still listed. Lets see what we can find in the Registry. Run the Farbar program .exe again as an Administrator. the task isnt found in the addition log. Continue with these scans if the problem persists. Please run the RogueKiller program one more time and post the fresh log. since last night, i haven't gotten a pop up yet so i think its fixed. Also Roguekiller only found something Norton related so i didnt touch that because i dont want my anti virus to be messed up. It may be a false positive. It may be a new version and RogueKiller is targeting an unknown file. You can submit the file to Norton. They will include it in the White list. 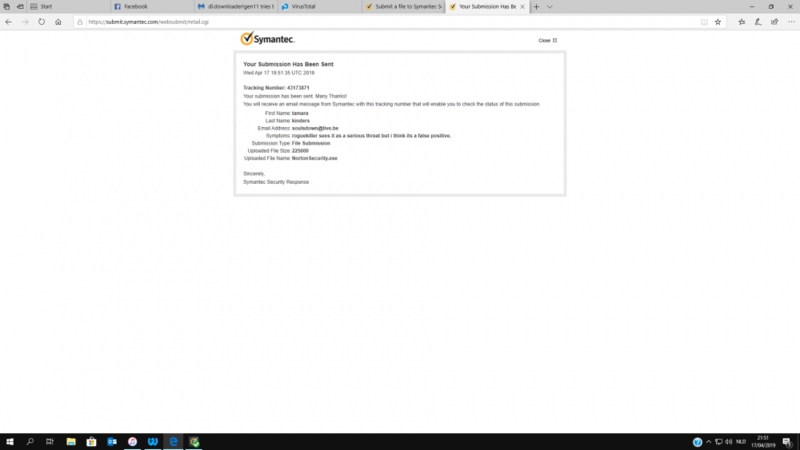 Customer Notes roguekiller sees it as a serious threat but i think its a false positive. 1. NortonSecurity.exe is a clean file. Submission Detail: This file is clean. Good, all should be well.